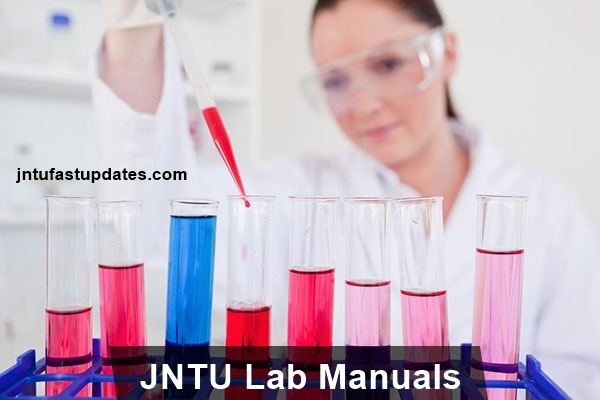 JNTUK Lab Manuals, JNTUH Lab Manuals & JNTUA Lab Manuals For All Branches. Download the JNTU Laboratory Notebooks for all regulations like R16, R15, R13…etc JNTU Lab Manuals with Viva Questions in Pdf format. Jntu Lab manuals free download subject wise here. Lab manuals and Lab programs For All Courses, All Branches & All Regulations in engineering. We are Provided Lab books for 1-1, 1-2, 2-1, 2-2, 3-1, 3-2, 4-1 & 4-2 semesters of all branches like civil, cse, ece, eee, mechanical, it, automobile, thermal engineering, cad/cam…etc. The Laboratory Manual is a reference manual for FDA personnel. It provides FDA personnel with information on internal procedures to be used as an agency policy for testing consumer products, training of laboratory staff, report writing, safety, research, review of private laboratory reports and court testimony. JNTU Lab Manuals for B.Tech/M.Tech/MBA/MCA/Engineering Students listed below. These Lab Manuals are uploded in pdf format. So simply click on the respective sub name and download the Laboratory Manuals in pdf format. All the Lab Manuals Are sorted according to subject wise (Listed in Alphabetical Order). Just click on the respective subjects to download the Laboratory Manuals. A laboratory notebook (lab book) is a primary record of research. Researchers use a lab notebook to document their hypotheses, experiments and initial analysis or interpretation of these experiments. The notebook serves as an organizational tool, a memory aid, and can also have a role in protecting any intellectual property that comes from the research. Remaining Lab Manuals will be updated soon. JNTUK B.Tech All Branches Lab Manuals Free Download, JNTUH B.tech First to Final Year All Lab Manuals download Free, B.Tech All regularions Lab Manuals and Viva Questions Download. JNTUH R16 Lab Manuals, JNTUK R16 Lab Manuals, JNTUH R15 Lab Manuals, JNTUK R13 Lab Manuals.